In March we ate the last of 5 1/2 gallons of lacto-fermented vegetables. They stored for over six months in our refrigerator and I didn’t boil a single pot of water. The product is a living food, full of enzymes and probiotics. The process is much faster than waterbath or pressure canning. The process (and storage) can be done with zero energy usage. A healthier product in less time and with less energy usage? Yes please! Before the advent of modern day canning, most of our fore-mothers preserved the harvest through lacto-fermentation. Dill pickles, sauerkraut, and kimchi are all products of this preservation method. Vegetables can be preserved simply with salt, water and spices – no boiling water baths necessary. The fermentation process creates lactic acid, nature’s preservative. This was one of the only options for preserving food until canning and electricity were so widespread. There is no need to “process” the jars and they can be stored in a root cellar or other cool place. The proliferation of lactobacilli in fermented vegetables enhances their digestibility and increases vitamin levels. These beneficial organisms produce numerous helpful enzymes as well as antibiotic and anti-carcinogenic substances. Their main by-product, lactic acid, not only keeps vegetables and fruits in a state of perfect preservation but also promotes the growth of healthy flora throughout the intestine. If you are intimidated by the process, know that you’ll get used to it. You will know if a batch has gone bad and you will find that once you figure out the basic process, there is little to it. Don’t be confined to recipes. Preserve whatever it is that you have in abundance, in any combination. Add flavors and spices that you like. Just be careful not to cut beets too small as they contain a lot of sugar and can produce alcohol. Be sure to leave 1-2 inches of head space. The fermentation process can cause the vegetables to “bubble up”. Clean your jars and equipment very well. You want to avoid bad bacteria at all costs in order to allow the good bacteria to proliferate. To help pickles keep their crunch, add clean grape leaves. The tannins in the leaves are said to perform this act. Last year I put up 1 1/2 gallons of cortido, 2 gallons of pickles, and 2 gallons of salsa. 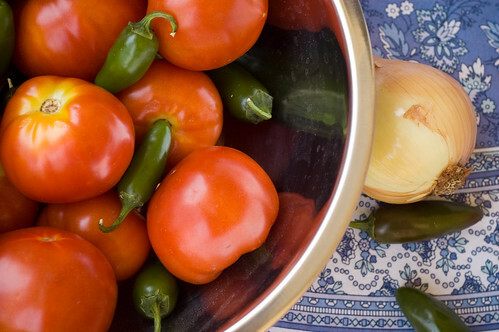 Salsa is by far our favorite, though no vegetable will be safe this year. These are the recipes that got me (and my family) hooked on fermented vegetables. If you prefer peeled tomatoes: score the bottoms, drop into boiling water for about 15 seconds, remove and place in ice water. The peels should come off easily. Chop all ingredients by hand or with a food processor to desired consistency. Mix and place in a very clean quart-sized, wide mouth mason jar. Press down with a wooden spoon, adding more water to cover the vegetables. Be sure to leave 1-2″ head space. Cover tightly and keep at room temperature for 2-3 days before transferring to cold storage. In a large bowl mix cabbage with carrots, onions, oregano, red pepper flakes, sea salt and whey. Pound with a wooden pounder or a meat hammer for about 10 minutes to release juices. 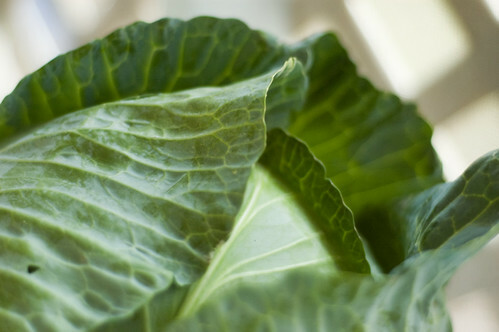 Place in 2 quart-sized, wide mouth mason jars and press down firmly with a pounder or meat hammer until juices come to the top of the cabbage. The top of the cabbage mixture should be at least 1 inch below the top of the jars. Wash cucumbers well and place in a quart-sized wide mouth jar. Combine remaining ingredients and pour over cucumbers, adding more water if necessary to cover the cucumbers. The top of the liquid should be at least 1 inch below the top of the jar. Cover tightly and keep and keep at room temperature for about 3 days before transferring to cold storage. 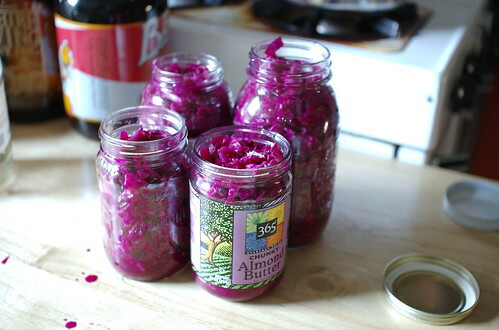 Have you ever tried lacto-fermentation? Would you be willing to give it a shot? ‘filtered water’. Can this be Ozark water found in the grocery store (since the tap water that comes into my home seems undrinkable even though I live in Austin which is considered a safe source of water. Please can someone shed some light on this. Great stuff. I never would have thought of fermenting salsa so thank you for the idea and the recipe. I’m a fat loss specialist and I truly believe that nourishing the body is one of the first steps in healthy fat loss. Keep up the good work! I have two recipes from my GG-Granny that my mother gave me. How would I convert these to lacto-fermentation? Directions 1. Soak tomatoes in boiling water, remove skins. Chop up into pan.2. Grind peppers, onions and apples and put into pot.3. Add vinegar, cinnamon, cloves and salt.4. Cook altogether at medium heat for 3 to 4 hours. Then jar. Directions 1. Sprinkle with pickling salt over top. Let stand overnight in crock.2. Next day drain crock. Directions 1. Pour mixture over the vegetables and bring to a boil.2. Jar. Hi all. I have never eaten LF foods – can you describe the flavour – is it similar to pickled vege? ie beetroot for example. I do pickle my own vegies but do water bath them – does this mean I didn’t really have to? You have one piece of information wrong through. You say “don’t cut beets too small, they have a lot of sugar and can produce alcohol.” While it is true that alcohol is produced by fermenting sugars, this is only the case with yeast fermentation, not with lacto-fermentation. Lacto bacilli produce lactic acid as their by-product. Sometimes yeast might get into your ferment and make it alcoholic, but this would have nothing to so with the size of the beet (or whatever ese the east n there is attraced to. You can safely even grind your veggies very small and ferment them and they will not be alcoholic. What is in the jars at the top of this post? I just bought a nice cabbage from the market and am planning on making the kraut which I also found in the Nourishing Traditions cookbook. I can’t wait! I have the same question as Bernadette about the flavour – does everything preserved this way have that pickled sort of flavour? Also, where do you get your whey? Thanks so much for this information!! I just made my first batch of salsa from your recipe above. You didn’t say to cover it with a cabbage leaf, so I didn’t. It’s been two days now and I haven’t needed to burp it (like the fermented veggies also from theis page). Am I doing this correctly. I’ve had to take a wooden spoon and shove the mixture back down into the jar because it separates into a clear liquid at the bottom. I’m wondering the same thing, I didn’t even know this was possible. I grow my garden for fresh salsa and don’t care for the over seasoned flavor of the cooked variety you usually see canned. I would love to do this but am wondering about the answers to the questions above. Thanks! 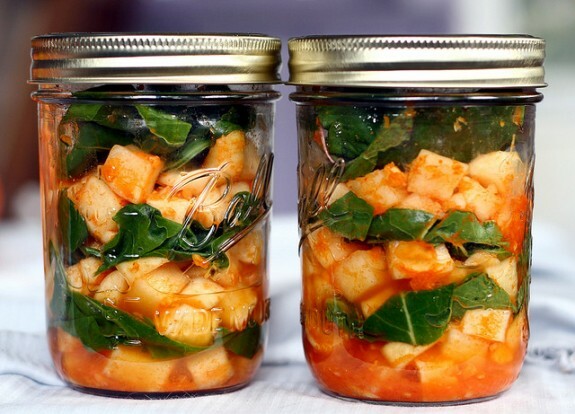 Keeping veggies in jars in the refrigerator is at least as energy-dependent as canning them. I love ferments, but that is not how my foremothers stored them without electricity. Cold storage DOES NOT only mean refrigeration. Root cellars in basements were THE NORMAL before refrigeration, except in cities where people lived in apartments. THAT is what your “foremothers stored them without electricity.” before someone decided that boiling food to perdition was the way to go. Perhaps for commercial canners with all the filth that existed (and STILL exists today) in canneries, but that was only to cover up their bad practices. Kind of like giving animals mega doses of antibiotics and anti-inflammatory drugs to hide the deplorable conditions most food animals live in. Cooked food from the supermarket (even organic brands) doesn’t mean the food was clean before being cooked. I am about to start this lf project this weekend. Is cold storage a cabinet that doesn’t get any light and is about 65 degrees or so during the daytime? If a root cellar is not available, any other alternatives besides the frig? Is it okay to use several table spoons of plain soy yogurt as a substitute for whey? I am wary of whey made from milk products because Stanley Prusiner (Nobel discvr prions ~ mad cow) said prion infected animals can pass on prions to others through urine, feces and saliva and there is no known safe way to remove prions in any animal product be it meat, milk, cheese, gelatin capsules etc. Symptoms of prions could take 10 years to show up. Boiling doesn’t help. Just found out that it might be better to use a fish (wild not farm* raised) sauce as a starter. *The problem with farm raised seafood is that they are fed (land animal) by products. In the wild it was discovered that deer, moose, etc w/the equivalent of prions in them spread from 2 states to 21 in less than 10yrs. Deer etc don’t eat meat as you know. Dementia has doubled in all industrialized countries except for one (which checks every cow for prions) country according to a survey. According to Prusiner organic cows are less safe in the US than other cows because the govt doesn’t inspect small herds. I just wanted to note that these Kraut Kap airlock lids are comprised of food safe components. Be cautious of the DIY petroleum based grommets and formaldehyde in the Tattler brand lids. Whey results in less than desirable results and is mainly used to inoculate your brew if you aren’t using an airlock system. An air-free enviroment will make mold or yeast growth impossible. The difference in flavor and texture between open crock whey ferments and air-free salt ferments is incredible! I am looking for bloggers who would like a free Kraut Kap in exchange for a review. Let me know if you are interested! I would love to test a Kap and write a review! Of course, it may help if I typed my email correctly. I’d love to try out and review the a Kraut Kaps on my blog if the offer is still available! I ended up her following links. I see all these questions and not 1 reply from Shannon. I always wonder why ppl bother with doing a blog when they refuse to reply to their visitors. Sussessful bloggers are the ones who participate in the comments. May I recommend disabling the comments section since you have no interest in interacting with your visitors. oops, I misspelled a couple of words.. Sorry… I wanted to correct one thing. Shannon did at one time reply to visitors comments and questions. Just hasn’t since September 2011. What temperature does a fermented item need to be stored , i.e. cold storage? I only have a crawl space and wondered if that would work. It stays between 30 -50 degrees depending on month. I want to make more ferments than I have room for in a designated refrigerator. Just curious where you get oak or grape leaves. I’ve searched and searched with no luck! What is the shelf life of something presserved via fermentation?